This past week, the 70th anniversary of the end of World War II was commemorated. It was on August 15, 1945, that Japan, the last axis power, announced its surrender to the allied powers after two devastating nuclear bomb attacks on Hiroshima and Nagasaki. It was a brutally destructive end to the most destructive period in human history. From 1939 to 1945, the world was in a constant state of flux as the competing sides fought for geopolitical control. Although the allied powers (initially led by France and the U.K., later joined by the U.S. and Russia) prevailed in the end, it looked very bleak indeed for the first few years of the war. The axis powers of Nazi Germany and Italy had taken most of Europe and the French colonies in Africa, while Japan was quickly gobbling up areas of China, Southeast Asia, and the Pacific. Only after 1944 did the allies reverse the trend, first taking back Europe and then pivoting to Asia. The war officially ended on September 2, 1945, with Japan’s signature of the instrument of surrender. The video below shows how the political boundaries of the axis, allied, and other powers shifted during every single day of the war from 1939 to 1945. YouTube channel Emperor Tigerstar is remarkable in putting together videos of maps which illustrate the change in political power over periods of time, such as the rise and fall of the Roman Empire. This video is a great example of how a well-made map can often explain a story better than words ever could. As you watch the front lines change, and listen to audio from speeches given by figures such as President Franklin Roosevelt, you can almost picture these historical battles happening before your eyes. During the six years of the war, over 70 million people died in total. Violence of this magnitude has, thankfully, not been replicated since. The two atomic bombs dropped over Japan have also been the only nuclear weapons to be used in war so far. As we remember the events of 1945, let’s also recognize the importance of restraint and diplomacy in resolving international conflicts in the future. The great turmoil and destruction of the war have become a memory which grows ever more distant. As political extremism around the world is once again on the rise, let us hope that such levels of destruction never return. In 1998, the ancient Kitora Tomb was discovered in Asuka, located in the Nara Prefecture of Japan. The tomb is relatively small but features beautiful paintings of animals (a black tortoise, a red phoenix, a white tiger, and a blue dragon) which represent the four points of the compass. Even more fascinating is a star chart on the ceiling which was discovered through further probing in 1998. In the years since, it has been the subject of a great deal of speculation as to its origins. When was the star chart created? What does it represent? What was its purpose? These are questions upon which researchers have failed to come to universal agreement. We do know that the chart appears to depict 68 constellations in the night sky, and the rings depict the movement of celestial objects such as the sun. Japanese astronomy researchers have suggested a date of creation between 520 BC and 40 BC, which could make this the oldest surviving star chart of its kind. Evidently, the chart was created several hundred years before the Kitora Tomb itself. Researchers Matsuru Soma and Tsuko Nakamura have come to the same conclusion with regard to the star chart’s vantage point: China. They believe that the view of the sky shown in the Kitora Tomb chart resembles the view that would be visible from modern-day Chinese cities such as Xi’an or Luoyang during this time period. A different hypothesis, from Kazuhiko Miyajima, is that the chart shows the view from Pyongyang or Seoul, in North and South Korea, respectively. Either way, it is curious that the chart depicts a view of the sky from a different vantage point from the place it was created. As the research continues, we may eventually have answers to the persistent questions of the Kitora Tomb Star Chart’s origin and purpose. Until then, we are left to wonder. In 1492, Columbus sailed the ocean blue, and Martin Behaim created the oldest surviving globe of the Earth. It’s a fascinating window into what Europeans generally assumed the world looked like before Columbus stumbled upon the Caribbean Islands. At the time, due to a miscalculation in the circumference of the Earth, Europeans thought that the distance to Japan and Mainland China was much less than it actually was. Columbus would insist until his death that he had in fact reached Asia, but it soon became clear that he was off his measurements by several thousand miles, enough space for two whole continents and an entire ocean to fit in the middle. 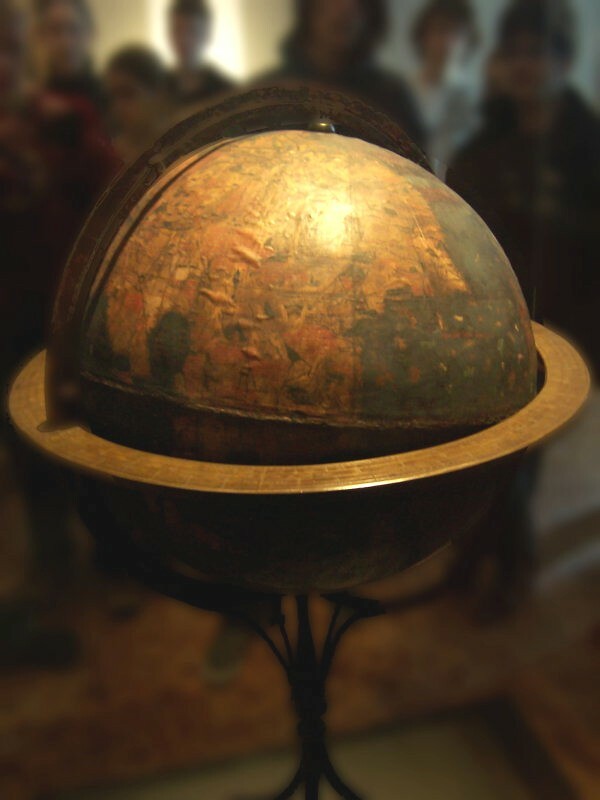 Reproduction of the globe of Martin Behaim, 1492. On the eastern side, we see the islands which Europeans had already charted: The Azores, the Canaries, and Cape Verde. At the time of publication, this was as far as Europeans had gone to the west, though, and the rest is just speculation. To the west of Cabo Verde is “Sant Brandan”, or Saint Brendan’s Island, a mythical island that Saint Brendan supposedly visited in the middle ages. The island was placed on many medieval maps in various locations, always just out of reach of the explorer, but never found. Nearby are the similarly fictional Antilia islands. Beyond that is the large rectangular island of Cipangu. This was the name given to Japan at the time, although Europeans knew little about it. Columbus thought any number of the Caribbean Islands he found could be Cipangu, indicating that China was not far off. As for China itself, it was then known as Cathay (or Cathaja on this map), and it appears on the map to the northeast of Cipangu. Knowledge of China was primarily based on Marco Polo’s travels there two centuries earlier, and his description of China’s exotic riches was one of the primary motivations for Columbus and others to sail west in search of a faster, easier trade route. Other names on the map in this area include “Mangi”, which refers to a province in Southern China at the time. I’m not sure about some of these other names, such as “Moabar”, but I think it refers to part of India.